Department Administrator is accountable for performing various administrative tasks. The job description entails coordinating departmental activities which can be clerical or managerial. 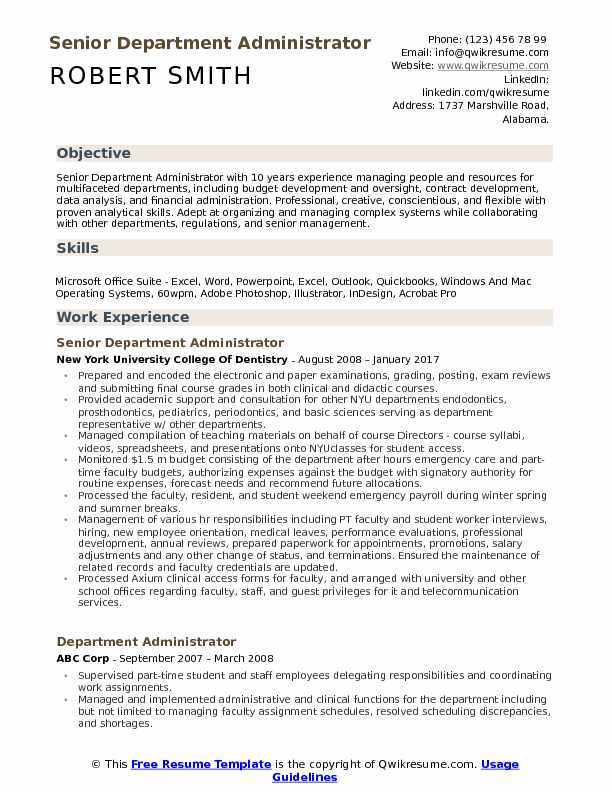 The roles and tasks found on the Department Administrator Resume include –overseeing the development and implementation of departmental programs, recruiting students for the department, monitoring student progress, preparing and administering department budget, hiring and evaluating teaching staff, making travel arrangement on behalf of managers and directors and supporting budgeting and bookkeeping tasks. 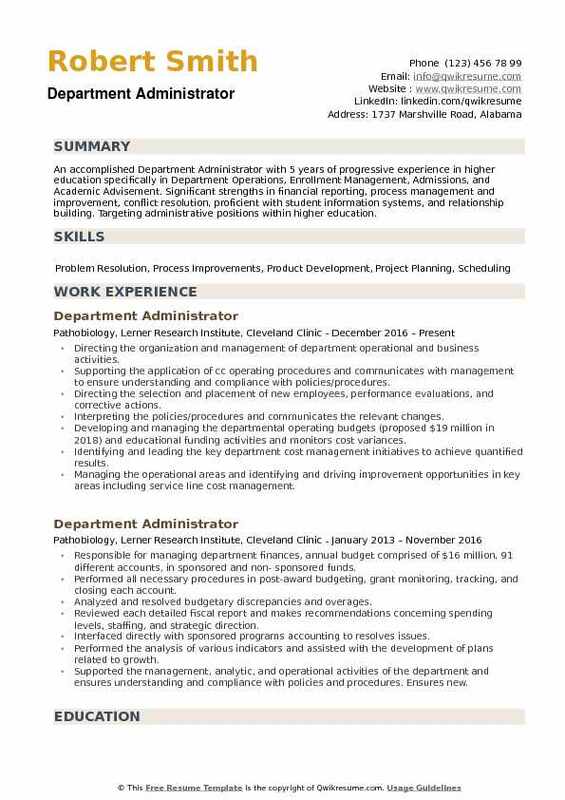 The minimum requirements that are expected from Department Administrator are proven work experience, outstanding communication and interpersonal skills, familiarity with management software, proficiency in basic computer programs, and knowledge about departmental policies and procedures. While a high school diploma and relevant work experience can earn this job, career advancement will be possible only with a College or Associate’s degree in the relevant field of work. Summary : Senior Department Administrator with 10 years experience managing people and resources for multifaceted departments, including budget development and oversight, contract development, data analysis, and financial administration. Professional, creative, conscientious, and flexible with proven analytical skills. Adept at organizing and managing complex systems while collaborating with other departments, regulations, and senior management. Prepared and encoded the electronic and paper examinations, grading, posting, exam reviews and submitting final course grades in both clinical and didactic courses. Provided academic support and consultation for other NYU departments: endodontics, prosthodontics, pediatrics, periodontics, and basic sciences serving as department representative w/ other departments. Managed compilation of teaching materials on behalf of course Directors - course syllabi, videos, spreadsheets, and presentations onto NYUclasses for student access. Monitored $1.5 m budget consisting of the department after hours emergency care and part-time faculty budgets, authorizing expenses against the budget with signatory authority for routine expenses, forecast needs and recommend future allocations. Processed the faculty, resident, and student weekend emergency payroll during winter spring and summer breaks. Management of various hr responsibilities including PT faculty and student worker interviews, hiring, new employee orientation, medical leaves, performance evaluations, professional development, annual reviews, prepared paperwork for appointments, promotions, salary adjustments and any other change of status, and terminations. Ensured the maintenance of related records and faculty credentials are updated. Processed Axium clinical access forms for faculty, and arranged with university and other school offices regarding faculty, staff, and guest privileges for it and telecommunication services. Summary : Dedicated Department Administrator with excellent management skills and extensive experience in managing budgets. 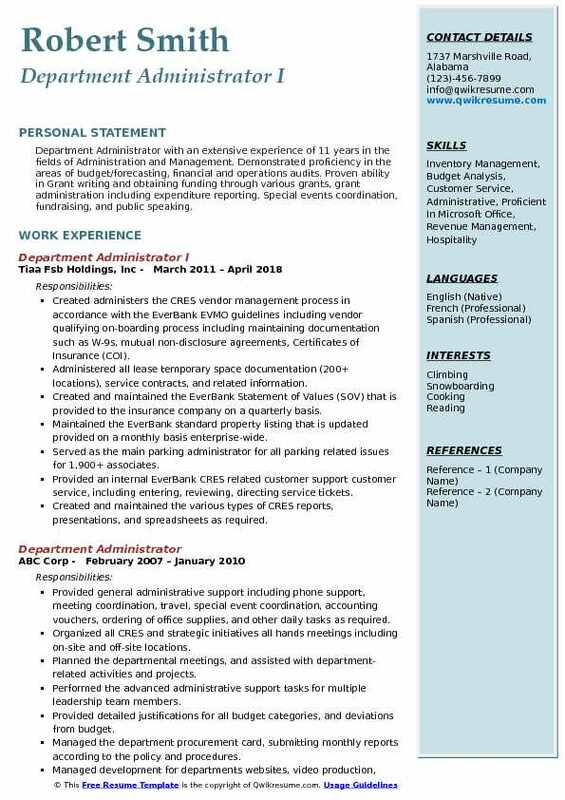 Seeking a position in an organization where I can use my skills and experience to improve operations, increase efficiency, and promote a positive work environment. Managed finances, oversaw and managed financial administration of departmental budgets, gift projects, and government grants using arc and internal accounting systems. Monitored and approved all expenditures for the department for approximately $1 million in the departmental budget and $15 million in grants and contracts. Met with Principal Investigators (PIs) and chair for a financial review of the departmental funds and grants. Worked with the Government, industry, and internal administrators Columbia Sponsored Projects Administration (SPA) and Sponsored Projects Finance (SPF) for the setup, reporting of expenditures, and closeout of research grants. Worked with faculty on budget preparation and grant proposal submission. Managed all payroll for faculty, research and administrative staff. Conducted yearly effort reporting for all personnel (effort percentages of time and salaries on projects and grants). 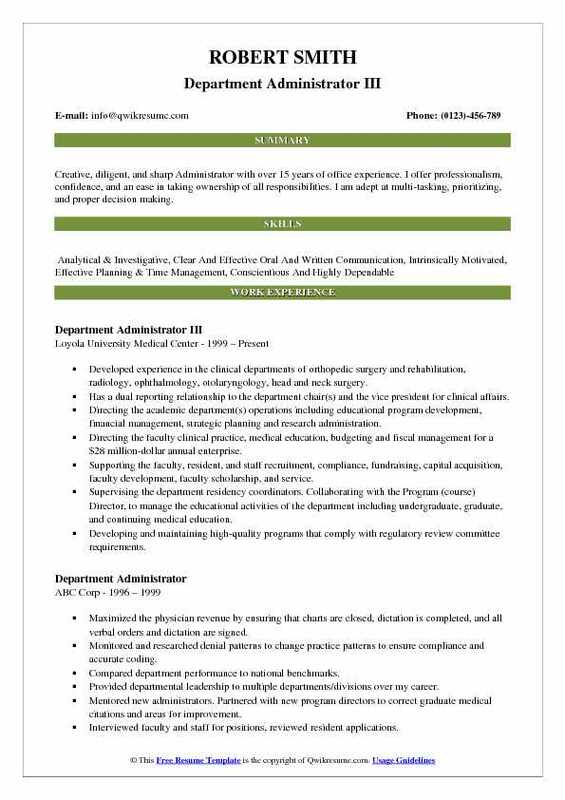 Summary : Creative, diligent, and sharp Administrator with over 15 years of office experience. I offer professionalism, confidence, and an ease in taking ownership of all responsibilities. I am adept at multi-tasking, prioritizing, and proper decision making. Developed experience in the clinical departments of orthopedic surgery and rehabilitation, radiology, ophthalmology, otolaryngology, head and neck surgery. Has a dual reporting relationship to the department chair(s) and the vice president for clinical affairs. Directing the academic department(s) operations including educational program development, financial management, strategic planning and research administration. Directing the faculty clinical practice, medical education, budgeting and fiscal management for a $28 million-dollar annual enterprise. Supporting the faculty, resident, and staff recruitment, compliance, fundraising, capital acquisition, faculty development, faculty scholarship, and service. Supervising the department residency coordinators. Collaborating with the Program (course) Director, to manage the educational activities of the department including undergraduate, graduate, and continuing medical education. Developing and maintaining high-quality programs that comply with regulatory review committee requirements. Summary : Resourceful Department Administrator with experience in performing a variety of support related functions by utilizing a vast range of knowledge in organizational procedures and policies. Exceptional written and oral communication skills with a detail-oriented approach to composing, editing, and proofreading, verifying the accuracy of correspondences and reports. Assisting the faculty, deans, and chair in the development of budgets for the department and faculty grants. Supervising two staff, 8-10 student employees and conduct all performance reviews. Acting as the main contact person for constituents by responding to questions or requests for information. Monitoring 18 budgets and 15 grants, performing the spending projections and reconciling all budget reports. Developing and maintaining the content on PS department website for the university. Coordinating the fall, spring and summer course schedules with registrars office and faculty. Coordinating and overseeing the annual alumni dinner for political science candidates. Reading and analyzing the incoming memos, submissions, and reports to determine their significance and plan their distribution internally. 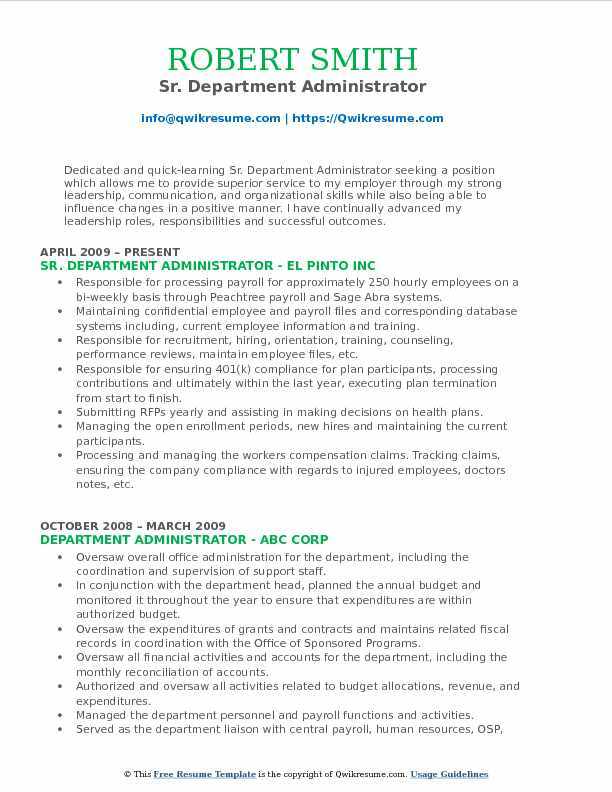 Maintaining a confidential demeanor with all salary letters and new hire information. Preparing all full-time, part-time and adjunct faculty letters of appointment each semester. Summary : Department Administrator with an extensive experience of 11 years in the fields of Administration and Management. Demonstrated proficiency in the areas of budget/forecasting, financial and operations audits. Proven ability in Grant writing and obtaining funding through various grants, grant administration including expenditure reporting. Special events coordination, fundraising, and public speaking. Created administers the CRES vendor management process in accordance with the EverBank EVMO guidelines including vendor qualifying on-boarding process including maintaining documentation such as W-9s, mutual non-disclosure agreements, Certificates of Insurance (COI). Administered all lease temporary space documentation (200+ locations), service contracts, and related information. Created and maintained the EverBank Statement of Values (SOV) that is provided to the insurance company on a quarterly basis. Maintained the EverBank standard property listing that is updated provided on a monthly basis enterprise-wide. Served as the main parking administrator for all parking related issues for 1,900+ associates. Provided an internal EverBank CRES related customer support customer service, including entering, reviewing, directing service tickets. Created and maintained the various types of CRES reports, presentations, and spreadsheets as required. Maintained leave trackers for all team managers as well as the CRES vacation/travel calendar. Assisted in other departmental services functions as required by CRES, travel services, and strategic initiatives management. 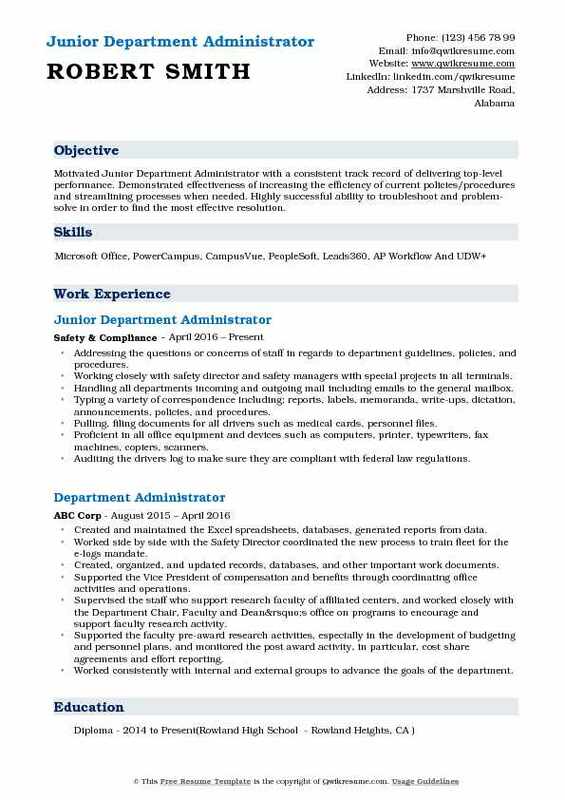 Objective : Motivated Junior Department Administrator with a consistent track record of delivering top-level performance. Demonstrated effectiveness of increasing the efficiency of current policies/procedures and streamlining processes when needed. Highly successful ability to troubleshoot and problem-solve in order to find the most effective resolution. Addressing the questions or concerns of staff in regards to department guidelines, policies, and procedures. Working closely with safety director and safety managers with special projects in all terminals. Handling all departments incoming and outgoing mail including emails to the general mailbox. Typing a variety of correspondence including; reports, labels, memoranda, write-ups, dictation, announcements, policies, and procedures. Pulling, filing documents for all drivers such as medical cards, personnel files. Proficient in all office equipment and devices such as computers, printer, typewriters, fax machines, copiers, scanners. Auditing the drivers log to make sure they are compliant with federal law regulations. 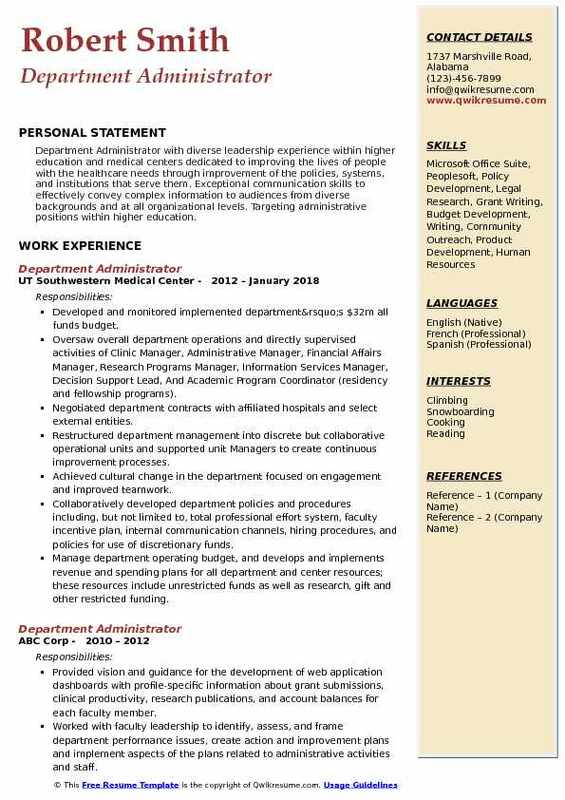 Summary : Dedicated and quick-learning Sr. Department Administrator seeking a position which allows me to provide superior service to my employer through my strong leadership, communication, and organizational skills while also being able to influence changes in a positive manner. I have continually advanced my leadership roles, responsibilities and successful outcomes. Responsible for processing payroll for approximately 250 hourly employees on a bi-weekly basis through Peachtree payroll and Sage Abra systems. Maintaining confidential employee and payroll files and corresponding database systems including, current employee information and training. Responsible for recruitment, hiring, orientation, training, counseling, performance reviews, maintain employee files, etc. Responsible for ensuring 401(k) compliance for plan participants, processing contributions and ultimately within the last year, executing plan termination from start to finish. Submitting RFPs yearly and assisting in making decisions on health plans. Managing the open enrollment periods, new hires and maintaining the current participants. Processing and managing the workers' compensation claims. Tracking claims, ensuring the company compliance with regards to injured employees, doctors notes, etc. Submitting the necessary ongoing documentation for each claim until the claim is closed. Maintained OSHA 300 log. 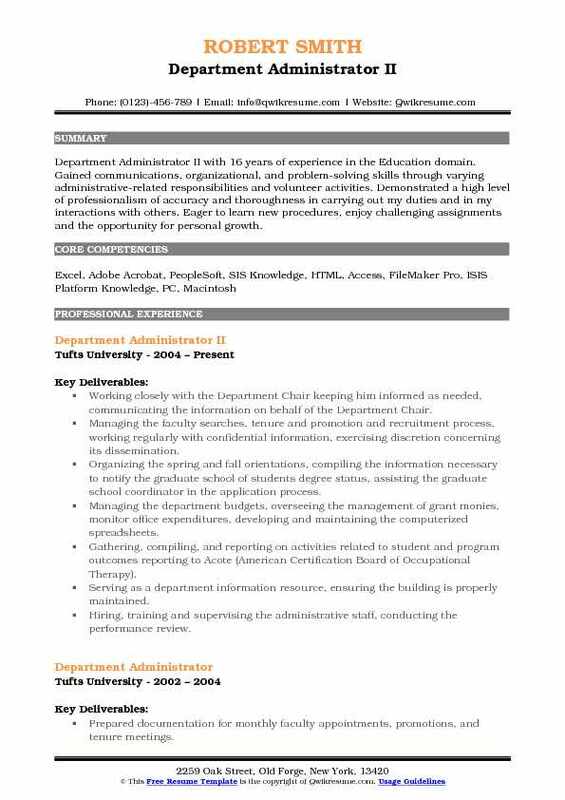 Summary : Department Administrator II with 16 years of experience in the Education domain. Gained communications, organizational, and problem-solving skills through varying administrative-related responsibilities and volunteer activities. Demonstrated a high level of professionalism of accuracy and thoroughness in carrying out my duties and in my interactions with others. Eager to learn new procedures, enjoy challenging assignments and the opportunity for personal growth. Working closely with the Department Chair keeping him informed as needed, communicating the information on behalf of the Department Chair. Managing the faculty searches, tenure and promotion and recruitment process, working regularly with confidential information, exercising discretion concerning its dissemination. Organizing the spring and fall orientations, compiling the information necessary to notify the graduate school of students degree status, assisting the graduate school coordinator in the application process. Managing the department budgets, overseeing the management of grant monies, monitor office expenditures, developing and maintaining the computerized spreadsheets. Gathering, compiling, and reporting on activities related to student and program outcomes reporting to Acote (American Certification Board of Occupational Therapy). Serving as a department information resource, ensuring the building is properly maintained. Hiring, training and supervising the administrative staff, conducting the performance review. Summary : Department Administrator with diverse leadership experience within higher education and medical centers dedicated to improving the lives of people with the healthcare needs through improvement of the policies, systems, and institutions that serve them. Exceptional communication skills to effectively convey complex information to audiences from diverse backgrounds and at all organizational levels. Targeting administrative positions within higher education. Developed and monitored implemented department’s $32m all funds budget. Oversaw overall department operations and directly supervised activities of Clinic Manager, Administrative Manager, Financial Affairs Manager, Research Programs Manager, Information Services Manager, Decision Support Lead, And Academic Program Coordinator (residency and fellowship programs). Negotiated department contracts with affiliated hospitals and select external entities. Restructured department management into discrete but collaborative operational units and supported unit Managers to create continuous improvement processes. Achieved cultural change in the department focused on engagement and improved teamwork. Collaboratively developed department policies and procedures including, but not limited to, total professional effort system, faculty incentive plan, internal communication channels, hiring procedures, and policies for use of discretionary funds. Manage department operating budget, and develops and implements revenue and spending plans for all department and center resources; these resources include unrestricted funds as well as research, gift and other restricted funding. 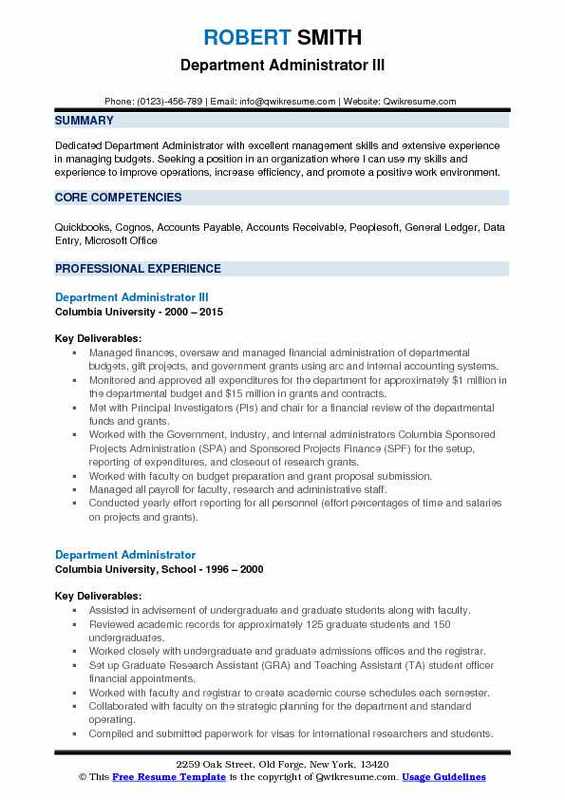 Headline : An accomplished Department Administrator with 5 years of progressive experience in higher education specifically in Department Operations, Enrollment Management, Admissions, and Academic Advisement. Significant strengths in financial reporting, process management and improvement, conflict resolution, proficient with student information systems, and relationship building. 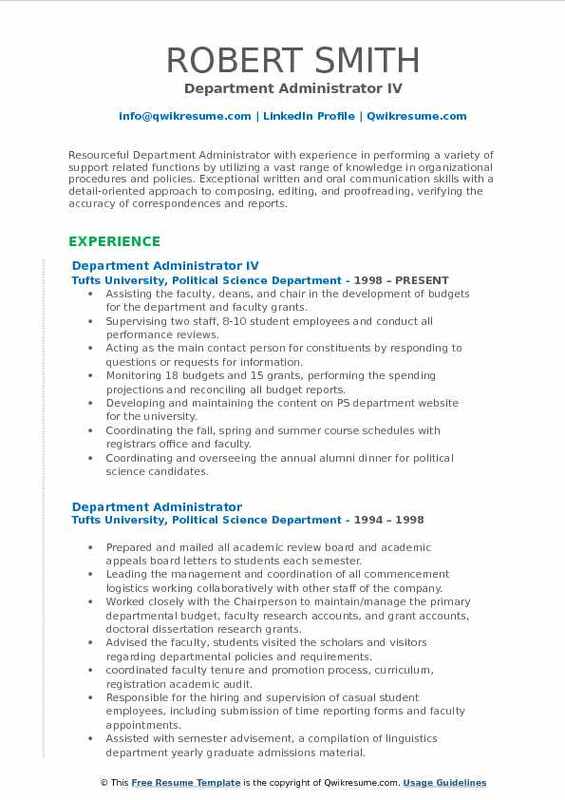 Targeting administrative positions within higher education. Directing the organization and management of department operational and business activities. Supporting the application of cc operating procedures and communicates with management to ensure understanding and compliance with policies/procedures. Directing the selection and placement of new employees, performance evaluations, and corrective actions. Interpreting the policies/procedures and communicates the relevant changes. Developing and managing the departmental operating budgets (proposed $19 million in 2018) and educational funding activities and monitors cost variances. Identifying and leading the key department cost management initiatives to achieve quantified results. Managing the operational areas and identifying and driving improvement opportunities in key areas including service line cost management. Assisting in implementing strategic initiatives within the department including institute growth strategies, new practice acquisitions, and marketing.